The Aim of our guild is to provide a learning experience for new or returning players. 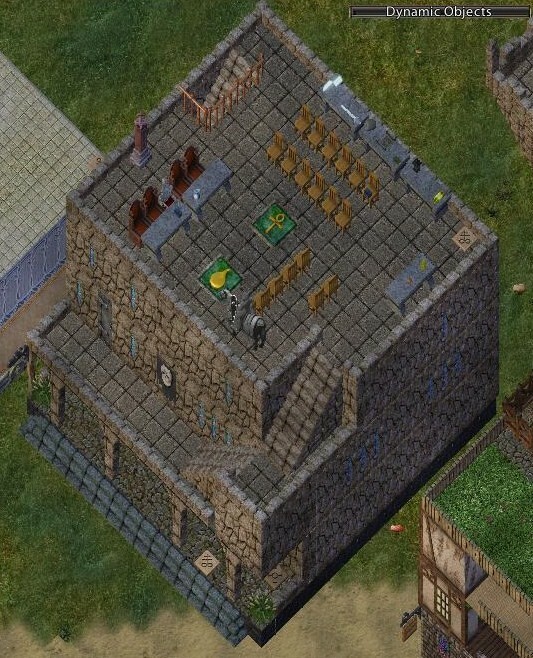 Ultima Online is way too big for an in game tutorial to do it justice, we aim to provide that tutorial and hope to help many players to get heading in the direction they want to go with any character in the world of Sosaria. If players find that their path leads them away from "We Die Alot!" we will help them find a guild that suits their play style. We will be opening lines of communications with many types of guilds on the Atlantic shard to find the right guild for members who wish to go. I want to encourage members to talk to us about their decision to leave us. It is our hopes that members will keep the lines of communication open with us instead of just dropping off the radar. Our guild has an open door policy, meaning we will welcome new members and willingly take back ex-members (unless they were ejected from the guild) if their path leads them back to us. Rank 1 Ronin - Ronins have no say in guild matters, can not access guild chests. Rank 2 Members - Members can access guild chests. Rank 3 Emissary - Emissaries are peope who can access guild chests, vote for a new guild leader, invite new members, promote ronins to members, give titles to ronin and member ranks, demote members to ronin and remove members and ronins. This will not be given to everyone. We will only have a few Emissaries to keep control of how many members we have. Rank 4 Warlord - Warlords are players who can access guild chests, vote for a leader, remover ronins and control the guild war status. We will only have one Warlord. Rank 5 Guild Leader - There is only one guild leader. Guild leaders have the final say in everything. Can promote, demote, invite or remove members. They can change the guild war status, accept alliance invites. After a short " getting to know you" period members a promoted from First rank of Ronin to Second Rank of Member. To be promoted to Emissary a player must show their personal merit. The leaders both observe and listen to feed back from the guild members and choose to offer Emissary rank to those who are shown to be willing to help others and make themselves readily available to assist those not just in the guild but all players. Emissaries need to show to all what our guild is about. Any guild member who is found to be at fault for a breach of any of the Codes of Conduct will be demoted to the rank of ronin. Should the breach be severe enough then that guild member will be ejected from the guild with or without warning. There will be no swearing in the guild chat, on the guild site, or at guild events. We have a community atmosphere, with such comes younger players and/or players with kids that might be watching. Let's show some respect to them please. It is easier to control what you type then it is what you say. Breaking this will result in warnings. Continual Breaking of this will result in being ejected from the guild. We will not stand for people begging for handouts. We have all earned what we have one way or another. We like to help people and teach them how to become a little more self sufficient. Multiple offenses of this will result in loss of rank and eventually ejection from the guild. We take this very serious in the guild. Breaking of this Code will result in being ejected from the guild. We die from enough stuff lets not add to it. Accidents do happen, whether from a sparing match or a mis-targeting, each case will be investigated and action will be taken.